The road from Montreal to Burlington is pretty straight and not that narrow. Highway 133, which stretches across the flatlands of southern Quebec like an dark open wound, takes you to the great Canada-US crossing at which point the it becomes the US 89. Like any major expressway in pretty much any country, the sidelines are littered with the typical yet essentially necessities of a good road trip: fast food restaurants, gas stations and casinos. All told, the trip down the super highway that separates the two east coast metropolises of skiing shouldn&rsquo;t take more than a few hours as the crow flies. 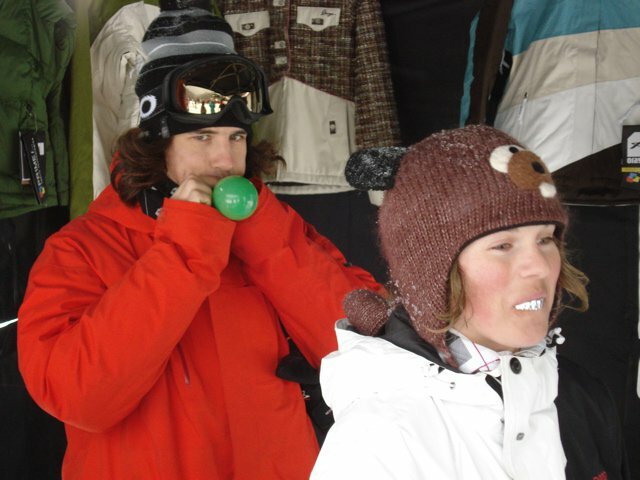 But much to the amusement of Orage team manager Cody Lynge, JP Auclair, Michelle Parker and myself, it was not to be. 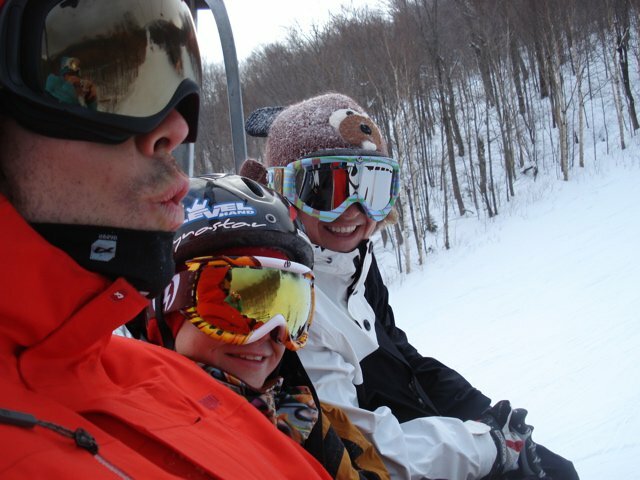 The four of us were en route to Stowe, Vermont for the first stop of the Orage Pros &amp; Powder tour. Stowe, along with the rest of the east coast, had just been hammered with a few feet of snow in the aftermath of a massive storm that blew through the Midwest, killing a handful of unexpectant SUV drivers and giving CNN something else to talk about other than Iran actually not having nukes. The storm then headed Northeast, and began taking care of business in the New England region, where one local after another claimed it was the best start to the season in 15 years. Vermont is a beautiful state. Driving through small towns with vintage movie theatres, weather-beaten mechanic shops and people waving to you as you go by makes you feel like time has stood still there since the 50&rsquo;s, and perhaps it has. It&rsquo;s one of the few places in North America where the troubles of the outside world feel so far away, and as a result, both Cody and myself found ourselves regularly commenting on how nice it would be to grow old and grey in each town we passed through. After a few twists and turns we were back on track on the 89, heading as fast and straight as a bullet to Burlington in time for the 3 o&rsquo;clock autograph session at the Ski Rack. After a quick stop at the US Orage office, we hit up the shop, watch some videos, pet some dogs, ate some orderves and gave out a few posters before heading up to Stowe for the night, and to no one&rsquo;s surprise, we go lost on the way there too&hellip;twice. The gracious host for the night was the Mountaineer Lodge who was cool enough to give each of us our own room, and to have a night manager who looked exactly like the front gate guard of the Emerald City in the Wizard of Oz, curled mustache and belly chain and all. We awoke the next morning to cloudy skies outside our windows with fresh snow on the naked maple trees and along the banks of the river flowing slowly beneath them. We packed up the truck and headed a few miles up the road to Stowe to kick off the festivities. After set up, a few laps and some time spent looking for an ipod with predominantly PG-rated music (which made Michelle and I&rsquo;s out of the question), the legion of groms began to materialize around the Orage tent to ski with JP &amp; Michelle. The scene at Stowe is quite the spectacle. Ben Grunow, who shredded the gnar for Level 1&rsquo;s cameras not so long ago, coaches the local freestyle club there and based on what we saw, is doing one hell of a job. A multitude of kids from the tender age of 10 to the reckless age of 20 could be seen killing the early season rails and jumps at all hours of the day with skill, style and confidence. So as is the case at each and every Pros &amp; Powder stop, after each lap the crew got bigger, and bigger, and bigger, until nothing less than a wild pack of jibbers had taken over the mountain as they screamed downhill with ear-to-ear smiles while JP &amp; Michelle brought up the rear. In between said laps, it was impossible not to notice that the Orage crew, consisting of Cody and Neil along with Steve Herrick and the one-and-only Mike Nick, were having as much of a blast partying in the tent as we were skiing. Cody and Neil were working the three-man slingshot firing off t-shirts and beer cozies into the unsuspecting lift line, Steve was cooking up hot dogs like the Iron Chef, and Mike Nick&hellip;well he was having more fun than anyone. Mike was working the mic so hard that he could put Luke Van Valin out of a job. In between his amusingly successful attempts to convince people that Tom Cruise and Katie Holmes were skiing at Stowe that day, Mike was hyping up the hot dog cook out by throwing down the best wiener jokes in comedic history. Even the crusty old ladies in line were keeled over in their one-pieces. The party was in full swing with too many people around the tent to count when Mother Nature and Old Man Winter collectively decided that we were having too good of a time. Right in the middle of a stellar wiener joke a violent wind straight out of the Himalayas came bellowing through the tent, picked it up like a newborn child and smashed into the ground 10 feet away, destroying the hinges and sending beer cozies and hot dogs everywhere. We were done. 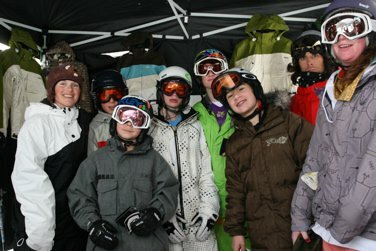 The crew packed up the gear, moved it inside and set up shop in the lodge for the apr&egrave;s give-aways and autograph signing. After all was primed and ready to go, Mike offered to show us the goods in the wooded backcountry and proceeded to take us on a nervous ride up the gondola where we all realized one downfall of reverse camber skis. The wind was so intense on the way up that it nearly blew my EP Pro&rsquo;s right out of the rack being that they didn&rsquo;t sit too well with their uber-soft and rockered tips and tails. I surely would have been walking down if it weren&rsquo;t for Neil, who saved the day yet again by opening the window and maneuvering his poles straps over the tips of the skis while we held onto the poles for dear life as the wind tried to blow them all the way to Maine. Once at the top, Mike led the way to some of the best tree skiing I&rsquo;ve skied outside my home hill of Red Mountain, BC, and being that it was the first day of the season the gondola was open, you can only imagine how good the snow was. From there it was back to the lodge for the aforementioned autograph session and a great big beerfest, as the good people at Orage bought the first 50 for some very happy locals. Looking back, it&rsquo;s hard to say who these events are more fun for, the kids, or the pros. As JP and I discussed at dinner the night before, these events tend to be his favorite of the year as it brings him back to the old Salomon 1080 days where they used to travel from hill-to-hill, putting on freestyle demos for stoked kids and shocked adults. The kids on the other hand, who may never have an opportunity to meet their heroes let alone ski and share a chairlift with them, look like Christmas morning has come early and needless to say, it&rsquo;s a joy to watch. But at the end of the day, the point isn&rsquo;t who&rsquo;s having the most fun...it&rsquo;s that everyone is. So do yourself a favor and check to see if the Orage Pros and Powder tour is coming to a mountain near you this winter, and if you can make it there having as much fun as we did getting lost on the way (oh yeah, and back), then hit it up. It might just be the best day you have all season. 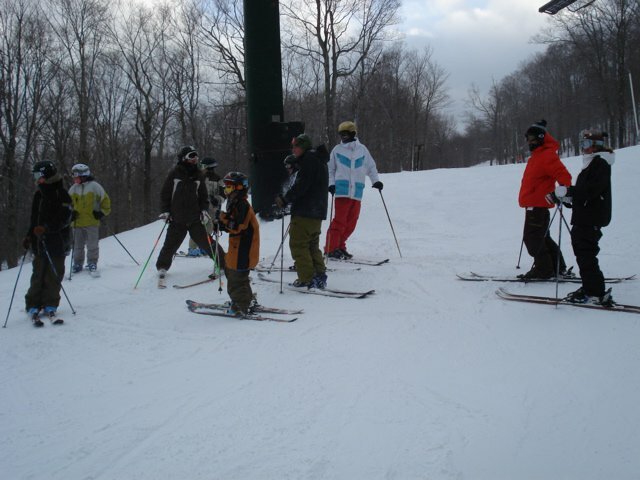 Special thanks to Kim Leslie from Stowe, Tim Dow from the Mountaineer Lodge and to all the kids who came out for the event. Keep on shredding! 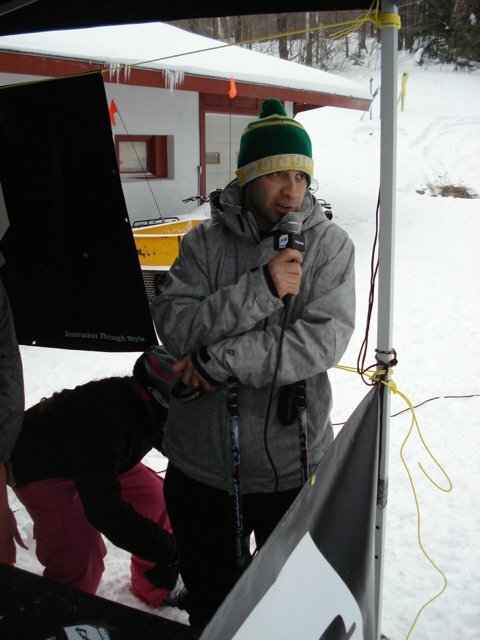 Orage Pros &amp; Powder Stop # 2 is this weekend at Le Relais, Quebec. With Stop # 1 under our belt we&rsquo;re well on our way for another successful season of the Orage Pros &amp; Powder Tour. This coming Saturday December 15th will mark Stop # 2 of the tour at Le Relais in Lac Beauport QC. Join guest pros JP Auclair and Phil Casabon at the 2nd stop of the tour this weekend anytime between 9:00am and 5:00pm for a chance to win a trip for two to Retallack Lodge in Nelson BC, an all day shred session with the team and an afterparty where we&rsquo;ll be tossing out loads more Orage schwag. A big thanks to our partnering brands Marker, Tecnica, Volkl, NS.com and Le Relais.